I believe dreams are achieved, not by limiting challenges, but by challenging limitations. He took my breath away. Witnessing the Birth of Miracles. Josh has had a very exciting two weeks. I am so excited and energized by his decision to get more physical that I emailed a note to the Ottawa Times and told them about his story. I was contacted by one of their reporters and she came to the house to interview us. I get so excited when I talk about Josh working out. I’ve been with him every step of his life and nothing, in his past, has prepared me for what I’m seeing now. The first thing Abbey did right with Josh was to talk to him. I am always interested to see how people respond to him. A lot of people ignore him. They may smile, or initially say hello when introduced to him, and then they simply stop including him. I don’t think they are being deliberately rude but more likely they don’t know how he will respond. Rather than put him in a situation where he is expected to answer and can’t, they don’t expose him to the opportunity. Other people will talk to him through me. They look at me, ask me questions, and then wait for me to give Josh’s answers. This is a scenario I’m very familiar with. Then you have people who just ‘get it’. They go up to Josh, look him in the eye, and talk directly to him. Abbey belongs in this last category. As Josh’s mom, I’ve watched him interact with people all his life. To people in the first category, the ones who ignore him, he pretty much ignores them back. He doesn’t put much effort into getting their attention or showing them, in any way, the bright young man he is. To people in the second category, the ones who greet him, then talk to him through me, Josh responds differently and I’m always interested in what makes the difference. To some, he just tunes out and doesn’t even really listen to what they are saying or what I’m responding. Sometimes, I’ll see him listening in with great interest, and answering questions before I can verbally do so. I get tickled by this because if the person talking to me had been looking at Josh, they would have seen that he was fully engaged in the conversation. To people like Abbey, the ones who talk directly to him, I see Josh at his best. He puts a lot of effort into communicating with her. His eyes are bright and making full contact with her. He’s vocalizing and putting a lot of energy into responding to her voice. He uses his yes and no responses correctly and effectively. When I see Josh in this mode, I realize how charismatic he could be if only he could vocalize. Even without words, he’s charming, and flirtatious, and handsome. The reporter who interviewed us had Josh responding with great energy. He is excited to share his journey. He wants people to know what he’s doing, and more importantly, what he’s accomplishing. Last week, at Josh’s workout session, the reporter and the photographer showed up. Josh, little ham that he is, always knew where the camera was, and Tom, the photographer, took so many pictures that he requested extra time to put together a slide show. He came back to Josh’s workout session this week to get additional audio. The story is set to run on April 3rd. When it happens, I’ll post a link to help people find it. But this week, the update is up to me and I’m not the photographer that Tom is. I get so caught up in what Josh is doing that I miss the really good shots. But here goes. Josh surprises us every week but this week, he did some things that we didn’t know he could do. And Abbey kept making mental notes to herself to write them down because once she saw Josh do them, she’s going to make sure he does them again. Josh starts out on the mat with Abbey taking him through range of motion. His severe reflex pattern continues to diminish. I am still so astounded by this that I go speechless to see it happen. At the end of the stretching session she asked him if he could raise his arms and touch her hand. The left arm, the one that usually winds so tight, straightened right out and floated upward. I could have cried. The right hand, the first thing he did was turn his head and locate where his hand was. I’ve observed him doing this since he was born. It appears to me that he doesn’t know where his hands are unless he can see them. Once he located his hand, his arm straightened but stayed on the mat. He didn’t quit. I could tell he was concentrating. He managed to bend his arm and I saw his shoulder come up off the mat. His hand was still in contact with the mat but his shoulder was in the right position. As I watched, I saw him concentrating to move the hand, and it moved. That was enough to make me happy. He didn’t get the job done but I could see he did that best he could and I expect him to do better every week. When a person starts a journey, it starts with the first step. This is his beginning. I missed taking pictures of that. I was too busy watching, but his next surprise, even though I missed the big ta-da moment, I did get a picture that sort of shows it. Josh loves being on the ball. 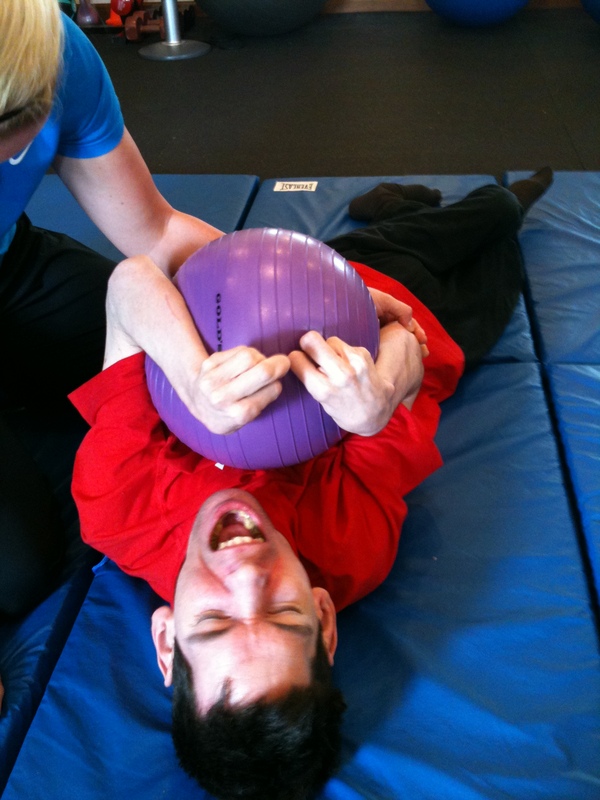 He is so thrilled to be able to control his head movement by using his core back muscles. This week, instead of going from left to right, we convinced him that he needed to stop in the middle and hold the mid-line. He did terrific. The Abbey rolled him backward to give his back a break and Josh did something that totally blew us away. He got his elbows braced on the ball, he found his knees and suddenly he pushed himself up onto his knees. We didn’t help him get in this position, he just did it. It was the first time I can remember him putting himself in a position that nobody helped him get in. I don’t even know how to explain what this means to me. This is a child who needs with every single position change. To see him move his body, get his balance, and achieve a comfortable, functional position, well, I tear up now just typing about it, you can imagine how I felt seeing it happen. By the time I ran to get the camera, he had worn himself out so I missed the big ta-da moment but you can see from this photo how he’s on his knees, and the look on his face shows you he knows he did something wonderful. Two more highlights of this weeks workout. We figured out how to get his right leg doing resistance training with the ball between the legs. We turned him onto his left side, freeing up the right leg and Josh went to town. I intend to get video of it next week. It’s truly astounding what happens. Abbey also figured out how to get meaningful arm movement when Josh is seated in his wheelchair. She had been putting sticky paper on his tray and asking him to touch each piece of paper. She usually ended up helping his hand slide from piece to piece. We were hoping that eventually muscle memory would help him but she found out this week, that if she moved the paper a few inches at a time, he follows along. It’s like he thinks, I can touch this, I can move two inches, and before you know it, she has him all the way across the tray without either of us ever touching his arm. So, we know he is capable of the movement. I think the distance from right side of the tray to the left was intimidating for him. It looked like such a big area and he would psych himself out before he tried. We know now, by watching him do it two inches at a time that he can move that distance without help. He just needs to believe he can. That’s it for this week. I’ll be back next week with another update. I’m so excited by this journey of Josh’s. He inspires me and I think I need to go over to my website and blog about it. Enjoy your week. We certainly are. I found your journey this week. So glad Josh and you are allowing us to be part of the journey. Tell Josh that he has that gene trait that makes for a very determined young man. Such a powerful trait and so glad he is going on this journey. Can’t wait till next week. So proud of him. Marilyn, I wish you could have seen Josh’s face when I read him your comment. He got emotional. It means a lot to him that you come to his website and share his journey. Thank you. Rhonda, thank you for stopping by and commenting. You should be the one working out right after Josh. I told Abbey I can’t even whine because Josh is watching and he works way harder than I do and does it with absolute joy. What astounds me the most is how fast his body is responding to the exercise. I can’t wait for you to see him next month. Nita, thank you. Some day I’m going to take a picture of Josh’s face so you can see how much your words mean to him. He’s homesick for you. We’ll see you in a few weeks. Josh…you were so communicative this past Wednesday when I saw you at the OAL Board meeting. I cannot remember you being so very verbal before. This, as I understand, was right after the workout. There are definite differences…. all good. Phyllis, you’re right. Josh vocalizes a lot more for several days after a workout. I think the exercise strengthens his diaphragm giving him more air and better control. Dr.Howd has said he can go to twice a week. I’ll keep him at once a week since that’s what we’re signed up for, then next month when I sign him up for the next four weeks, we’ll see if we can fit him in for two hours a week. I think if we can get him in twice, with the effects lasting several days, we can get him almost the whole week with the improvements we’re seeing. I also am seeing a dramatic decrease in the reflexes that give him so much trouble. I am so excited about this journey Josh is on. Thank you for stopping by and checking out his update. Oh, wow! Josh, you are absolutely amazing! I teared up when Abby asked you to touch her hand, and you worked so hard at it! Your determination is powerful. I’m in awe! I can’t wait to see you in a few weeks and see for myself how far you’ve come. This is such an exciting journey for everyrone who loves you! Marti, I hope you could feel his energy in some small way. To be in the room with him and watch him, I can’t even use the word struggle, because he doesn’t. Every week he comes in and I can see that he has already decided what he is going to do. Abbey and I can barely get him positioned when he is moving in ways that surprise us. I started this journey hoping that it would improve Josh’s over-all health. I didn’t really have any expectations. But from day #1 Josh has been showing me something new. What he does comes from within him and I have discarded any pre-conceived notions that may have slipped into my brain when I wasn’t looking. I’m just stepping back and watching him go.